This is a great 'magical' activity that will surprise and delight all ages! 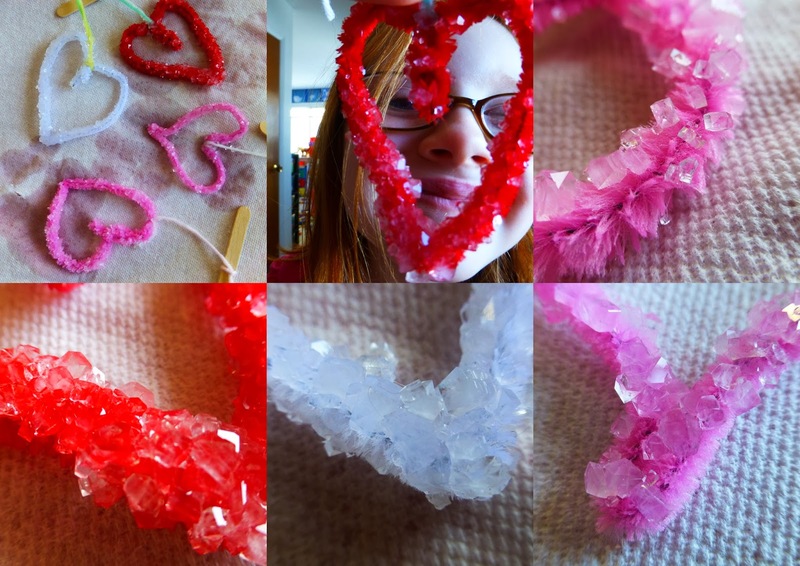 The kids were absolutely stunned by the crystals that formed on these Valentine hearts, as was I. Maybe you've made borax crystals before and know just how awesome they are, but this is a new art-form to us! During the holidays, the options would be endless--stars, spirals, wreaths, circles. In fact, I had hoped to try this craft during the holidays, but time ran short. We love how our hearts turned out so much, that we may try making some green and white crystal shamrocks for St. Patrick's Day next month. Noah decided when we do it again, he wants to make this abstract shape, which I think will turn out really cool! So of course, I'm saving his shape for him. 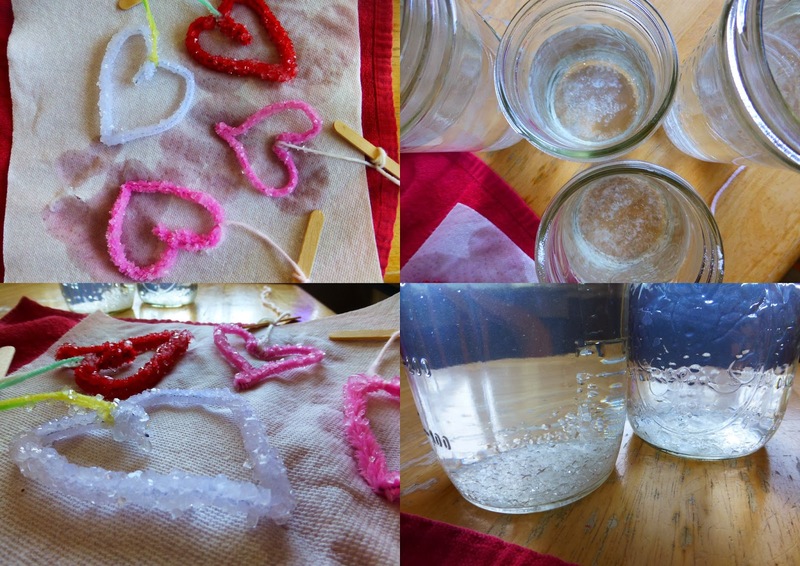 :) (If we hadn't used up the rest of the borax, we would have put it right alongside the hearts). You are probably noticing that your full mason jars are being replaced by empty ones, as you use up your canning stash. Boo!!! It's satisfying to know you are eating up your own store of food, but bittersweet to be running out (at least, if you are new at canning like I am and haven't quite got to the 'this harvest will last several years' stage yet). But, hey...using mason jars for a fun project is a great way to put some of those sad, empty containers to good use, even if just for the day. ;) Wide mouth jars work best, so you can easily get your shapes in and out. Note: If you are wondering if borax is toxic and shouldn't be used with kids...I wondered that too. I have seen borax used in a lot of homemade laundry soap recipes, and I assume it's safe and natural. In fact I've used it in other kids crafts with that assumption. This time I went ahead and googled, and found This blogpost from Crunchy Betty discussing borax as a safe and natural, non-toxic ingredient that many people use in homemade cleaning products. Some people even eat it. Wow. We aren't planning on doing anything but making crystals, so we should be good. So let's get started! 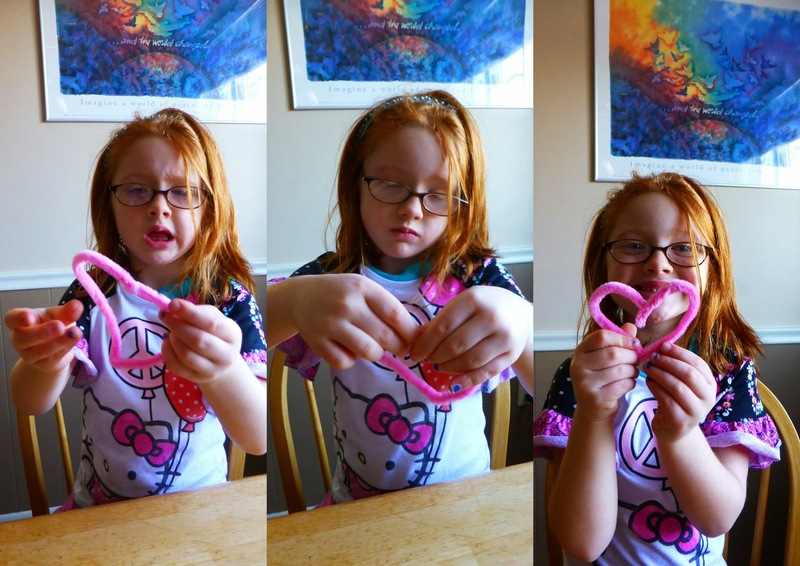 You really ought to try making these...the kids in your life (and YOU) will be utterly fascinated. 1. Gather up the materials. 2. Start a pot of water on the stove so it will be boiling by the time you need it. 3. 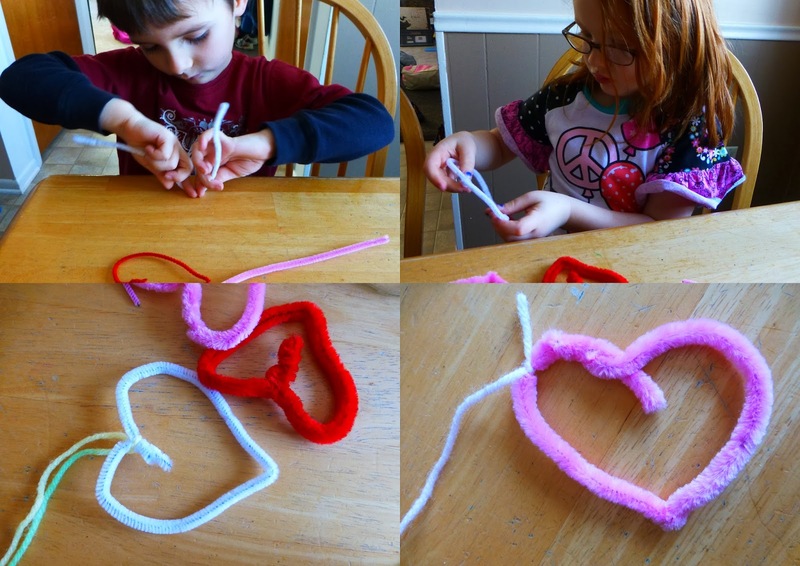 Make hearts out of the pipe cleaners. This is really not as hard for little hands as you would think. I was impressed by how they worked it out! 4. 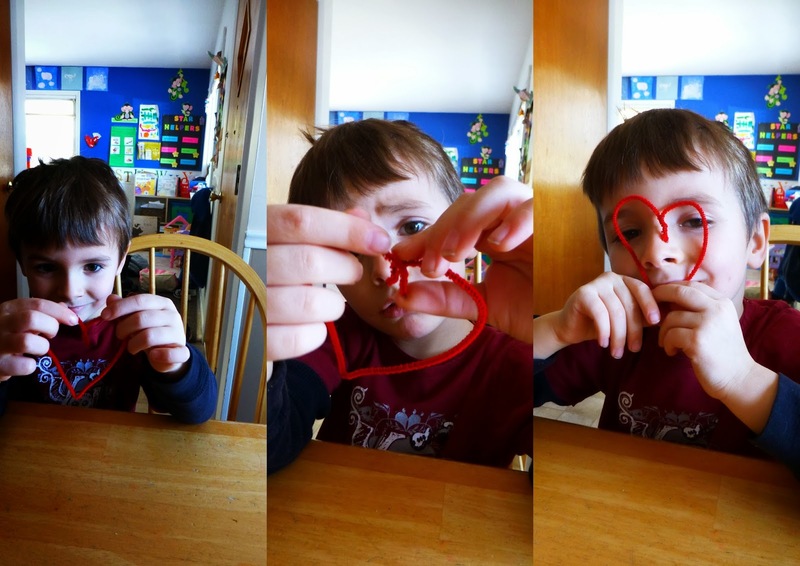 Tie yarn to each heart, then tie the yarn to a craft stick. You can also just use tape to attach yarn to the stick, but I like being able to 'crank' the yarn up by turning the stick so that the heart will hang exactly where you want it. 5. Ladle boiling water into each jar (this is where a tea kettle would really come in handy), while the kids stand way back. Add 1/3 c. borax into each jar, and stir well, but carefully. 6. 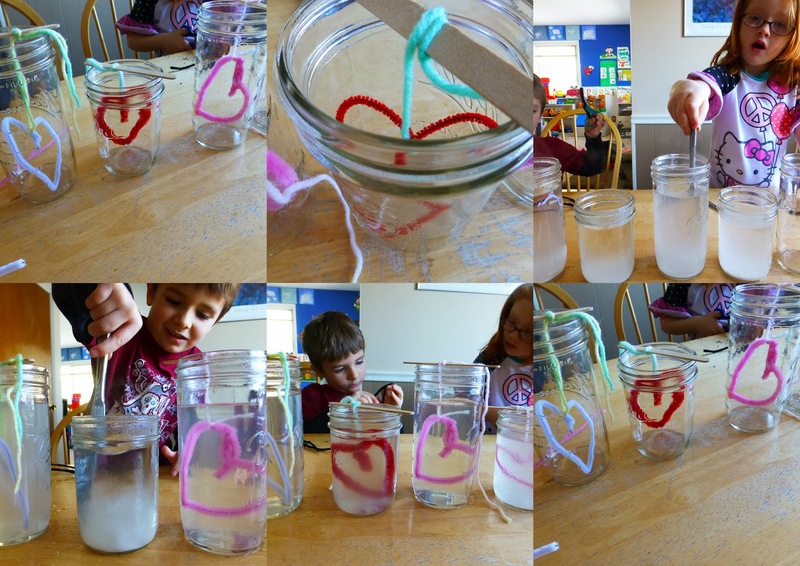 Hang the hearts up in the borax water by placing the craft stick on top. 7. 24 hours or more later, pull your shapes out and lay them on a paper towel to dry. The crystals will already be hard when you pull the heart out. We hung ours up almost immediately. Add ribbon if you want, or just hang with the yarn. You'll want to pull them down and examine/ admire them up close in the light, often! Just so fascinating. Oh yes, not only these crystals look so gorgeous, it is a very fun activity to do with your kids. I just love the beautiful colors, it looks like they are made from glass or some precious stones.